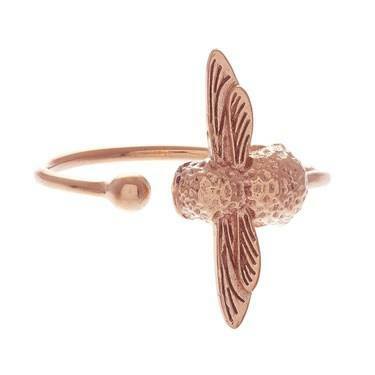 Create some buzz about your look with this beautiful bee ring from Olivia Burtons Jewellery Collection. Style with other rose gold pieces for an elegant look or mix up your metals for an on trend style. Again I bought this for my daughter as Bee is part of her nickname! She loved it and wears it every day and has had many compliments on what can unusual but lovely ring. Cannot fault Olivia Burton or Argento for their excellent jewellery and customer service! Always my go to for presents. Lovely ring to wear aesthetically, however the design of the ring makes it impossible to wear as it catches on everything and then bends out of shape. Very thin and flimsy band.